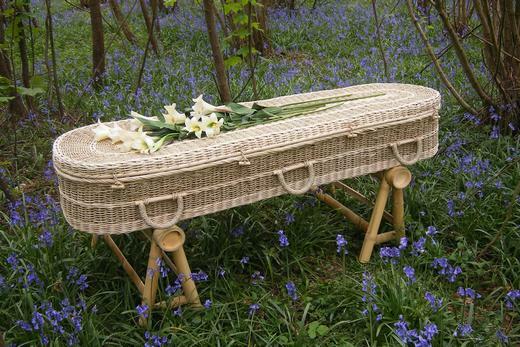 A green funeral often includes a ‘natural’ burial in woodland or meadow, but it may also be seen as a funeral in which the family and friends have more active participation and make environmentally friendly choices of coffins and cars, whether for burial or cremation. ** We are offering a burial at Sharpham Meadow for £850 less than the other main funeral director for Sharpham. Heart & Soul Funerals is committed to green funerals and as Green Fuse we were a founder member of the Association Of Green Funeral Directors. Around a quarter of the funerals we undertake are natural, woodland and private land burials. We have arranged and held green funerals at many of the woodland burial sites in Devon and helped families to participate in funeral arrangements, whether you want an eco-friendly coffin or shroud, to decorate the coffin, care for the body of the person at home, provide transport for the coffin to the funeral, or have a private land burial and other choices. You can still have a religious service, or choose an independent funeral celebrant to write a ceremony according to the life, values and beliefs of the person who has died, or hold a service yourselves. We have the means to play music outdoors. And quite a few umbrellas, just in case! We also have a beautiful stone barn where ceremonies can be held before going off to the natural burial site for the burial, and to which you can return for tea and whatever refreshments you choose.